The Metal Adjustable Foot Rest from 3M provides users with an oversized non-locking platform surface that features foot-activated tilt ± 16° from level. 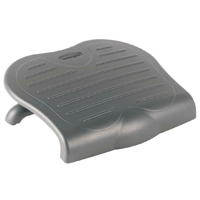 The entire foot rest is formed from lightweight sheet steel assembled to create a sturdy foot support. A single height adjustment from 4" to 4.75" can be performed using wing nuts and thumb screw connectors. 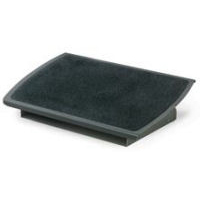 Specialized 3M Safety Walk anti-slip material covers the entire platform surface to aid in maintaining foot position and is also used on the underside to ensure the foot rest remains securely positioned. The ErgoUP Single Leg and Foot Rest has been designed to provide a universal leg support accessory for contemporary office chairs. This model supports one leg at a time, either beside or under the desk of the user, and is the smallest size available with the most efficient footprint. This makes it most suitable for situations where the Double or ErgoCurve model may not have sufficient room to be deployed. The leg rest comes with either Standard or Memory Foam padding, comfortably keeping the foot, knee and hip properly aligned while elevating the foot and leg. The ErgoUP is often used following surgery in order to relieve knee and foot pain, increase blood circulation, reduce pressure on the spine and decrease fatigue. The ErgoUP can be used on most standard office chairs (see note) and functions much like an ottoman does in home environments. The support attaches to the central post of the user's office chair with a velcro strap and rotates 360° to move to the side or rear of chair as required. It can also be fully adjusted in height and distance from the seat. The 1.5" thick square pad is 12" wide x 12" deep and automatically tilts to a comfortable angle for the user. It is available with either furniture fabric or leatherette coverings, with padding options of Regular or Memory Foam. NOTE: Bases with an unusually high crowning may not be compatible with this product. Please see the Dimensions image on the Detailed Specifications Page. The FootFidget is an innovative device which addresses the desire for movement in order to assist in maintaining focus on a task, something experienced by many people, young and old alike. The FootFidget provides a discrete means of releasing energy as users unobtrusively "bounce" their foot. 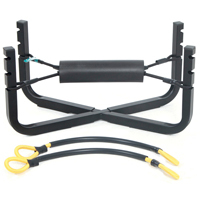 The resistance bands offer immediate tactile feedback, notifying the muscles that activity is occurring. The included bands offer two levels of response or can be combined to create a third higher level of resistance - more suited for activity while in a standing position at a counter or sit-stand desk. 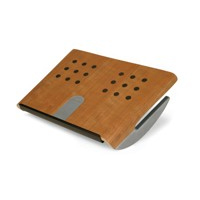 Requiring no more space than a traditional footrest, the FootFidget can also serve as a footrest while offering the additional benefits of encouraging circulation. With 3 height settings users are able to position the Fidget Bar at a height that meets their particular requirements. The FootFidget is by no means restricted to the office environment. It can also be used for a variety of other purpose, including improving circulation in the legs for users such as those who have limited mobility or may be restricted to a chair or seat, balance training, to aid in addressing "restless legs syndrome", or even as a passive means of burning calories through casual use while relaxing at home. The FootFidget is lightweight (2.5 lbs) and is easily moved to where it is needed. The ErgoUP Double Leg and Foot Rest is a universal leg support accessory for contemporary office chairs. 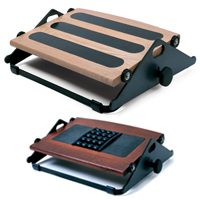 This model, with an 18" width, is wide enough to support either one or both legs either beside or under the desk of the user. This makes it most suitable for situations where the Single or ErgoCurve model may not be wide enough for the user. 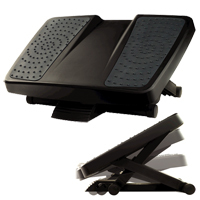 The leg rest is available with either Standard or Memory Foam padding, comfortably keeping the foot, knee and hip properly aligned while elevating the foot and leg. The ErgoUP is often used following surgery in order to relieve knee and foot pain, increase blood circulation, reduce pressure on the spine and decrease fatigue. The ErgoUP can be used on most standard office chairs and functions much like an ottoman does in home environments. It provides an elevated leg rest ottoman with casters which can easily move to accommodate the needs of the user. The support attaches to the central post of user's office chair with a velcro strap and rotates 360° to move to the side or rear of chair as required. It can also be fully adjusted in height and distance from the seat. 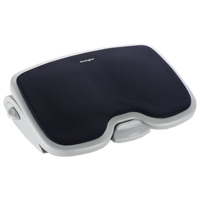 The 1.5" thick rectangular pad is 18" wide x 12" deep and automatically tilts to a comfortable angle for the user. It is available with either furniture fabric or leatherette coverings, with the option of Regular or Memory Foam. Three angle settings to help prevent lower back pain. Textured platform (18" x 14") to help massage tired feet. Non-slip feet enhance overall stability. 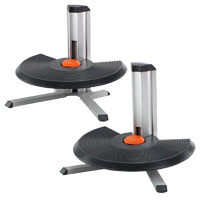 The Discus T Footrest from Score offers a large disc-shaped platform mounted to a sturdy extruded aluminum base and is capable of supporting over 175 lbs. The height adjustment is controlled by a gas cylinder with a large foot-actuated release button conveniently situated at the rear of the platform. The platform tilts freely from between approximately +5° and +30° to encourage active movement throughout the day. There are two models of the Discus T that offer different ranges of height adjustment. The Discus T 150 adjusts from 2" to 5.9", while the Discus T 250 has a range from 5.8" to 9.8".